The Chicco Cortina Together Double Stroller is the first two-passenger stroller to accept 2 of the #1 Rated KeyFit and/or KeyFit 30 infant car seats. With the same easy click-in attachment as the Cortina, the Together takes a car seat in both the front and rear seats so families can travel together easily with 2 infants, 1 toddler and 1 infant or 2 small toddlers. 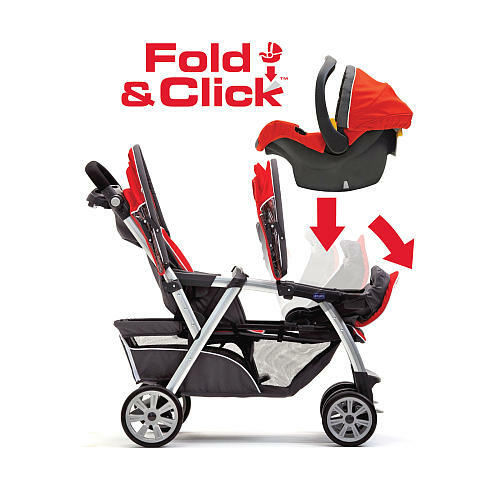 Exclusive, forward-fold front seat accepts the KeyFit or KeyFit 30 infant car seat without the need for attachment bars or straps. The rear seat has a full recline for bassinet enclosure. The extra large basket has plenty of storage. 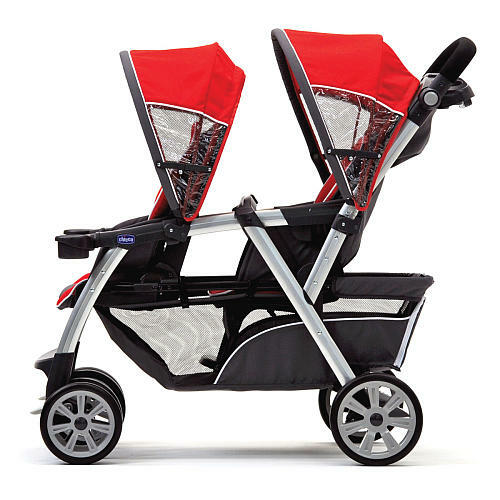 The Cortina Together is 15% lighter than most comparably featured double strollers. Tailored, yarn-dye woven jacquard fabrics and plush padding give children style with comfort. Keeping all the great features parents love in the Chicco Cortina, the Together has a one-hand fold, all-wheel suspension, one-touch linked rear brakes, a 5-point harness in each seat, and a freestanding flat fold. Height-adjustable handle, multi-position removable canopies, armbar and 2 cupholders for the child and a parent tray with 2 cupholders and storage compartment. 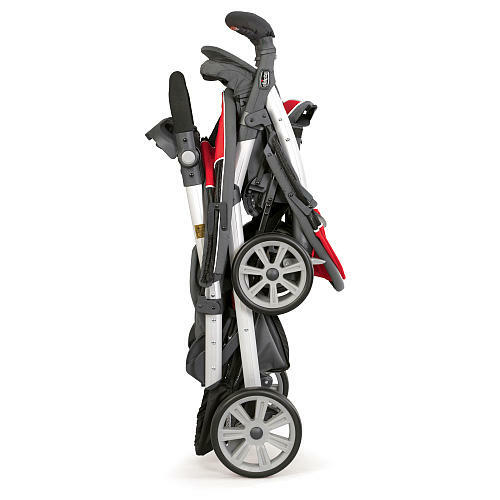 Build your own travel system with matching KeyFit/KeyFit 30 (sold separately). Easy basket access with zippered entry – even when backrest is fully reclined! The cubes pattern is conservative and sylish, and I really like it. The frame on the stroller is solid and sturdy. The pieces that are plastic seem to be a thick, sturdy plastic, and not at all flimsy. The wheels are a good size and have a bit of give to them – they’re not completely hard – which makes for a smooth ride for the kids. The fabric feels like a good quality, and seems to be stitched well. The seats are on the smaller side – 14" wide – which I love. My kids seemed to slop around in some of the other strollers with bigger seats, and they didn’t seem as comfortable. These seats are a great size. The five point harness is really nice, and the buckles seem to be sturdy. The adjustable handle is really nice. I’m 5’5", my husband is 6’3", and we can both push the stroller comfortably. Neither of us kick the wheels, which is so nice! The stroller is tall, which makes it easy to get into the basket underneath. The basket is big and the frame of the basket is strong. You have the option of putting two cupholders on the front seat or a bar. I went with the bar, and I was glad to see that the bar is covered with fabric, rather than a foamy material. The babies aren’t going to be biting pieces of foam off of it! The stroller is not as long as some of the other doubles – it is 47 inches or so, front to back. It is easy to fold and unfold, and stays folded when you fold it, without requiring you to flip switches or levers to hold it together. It steers like a dream, and is so easy to push. I love, love, love this stroller! I was so happy to see that Chicco came out with this stroller, I have the travel system in the red color so I was bummed that this stroller through babies r us doesn’t come in the red color yet. But I am so happy that I got it anyway. I am a mom of a 9 month old with a little boy on it’s way due in August. I am so excited that I won’t have to buy a whole other travel system and that I will be able to use the same car seat as I did with my first. I am so happy!! I loved this double stroller as soon as I tried it after trying numerous double strollers. 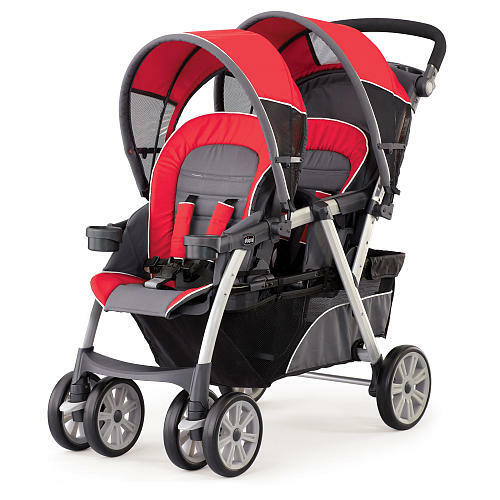 They sell this stroller in Fuego (RED) and Romantic (Black & Grey) at […] but I liked the color "Cubes" […] which is frustrating as my family has been trying to have them track one down for my baby shower and they still can’t get their hands on one. I am due in August, so I am hoping they accomodate me soon, or else I will move my entire registry to [@]. Love this stroller! I was excited to find out Chicco was coming out with a double stroller when I was pregnant with our 2nd child. I was due in April. My girls are 3wks and 22 months old. My oldest LOVES to ride in front and the back is perfect for my Chicco carseat I already had. I love that the cup holder and bar for the front are interchangable. Adjustable handle bar is awesome. Being able to get into the cargo basket with the zipper is great, I don’t have to take the carseat out just to get to my stuff. the Cubes design is awesome! My carseat doesn’t match, but I figured that’s better than buying a new system. It folds up nicely and fits in the back of my Acadia. I’m not sure if it would fit well in smaller trunks. It is a bit heavy, but that’s to be expected with a double stroller. I would definately suggest this stoller! I have been searching for a double stroller since I found out I was pregnant with my, now 4 month old, daughter. I had the Chicco infant carrier from my son, who is now 3, so until now, a Chicco double wasn’t an option. I debated and debated about what to do…I am a planner and I did not want to wait until now to get my double!!! BUT, I am soooo glad I did! The stroller is as perfect as my single Chicco stroller system…and the zipper on the bottom compartment is the neatest feature…you can actually use the storage basket when you have the infant carrier in use!! Thank you, Chicco, for continuing to make excellent products. My baby, my pre schooler, and I will enjoy our walks and shopping trips so much more, now!!! Was what we expected, not extremely heavy, my kids love it. everythign has been said pertty much!! great stroller, my 21month old and my new born enjoy it very much! light and practical compared to others modern look and feels sturdy! GREAT BUY!! I have been a fan of the Chicco Keyfit/Keyfit 30 car seats for a while, convincing my friends to get it and purchasing 2 for my twins. Prior to Chicco releasing this stroller, I used a "snap and go" type stroller. Now that the Chicco has a stroller that will accommodate both Keyfit car seats, I am one happy mama. I switched for the following reasons: 1) The Chicco Together stroller is easy to get through doorways (vs the side by side Chicco Trevi 2) The Chicco Together stroller is MUCH easier to push/steer once the babies start gaining weight. My boys are 3 months old and the snap and go became very hard to steer once they hit about 12-13lbs each. The Together stroller can turn on a dime which makes life much easier, especially when you are by yourself. My major complaint is that it is heavy. I could not have used this stroller immediately after having my c-section like I could the snap and go type. Also, it is a bit pricey…but I’ve learned that as a mother of multiples, price isn’t always as important as is convenience and safety. Thank you Chicco for finally making this stroller. Havent used it yet but had to put it together I still have 3 months till i get to use but i love it all ready and my 2 year old had to try it out too. Easy to put together and looks great. Two minor complaints, the foot rest for the front seat is not big enough, my two year olds feet keep touching the front wheels. Second, the front seat doesn’t recline, I have to switch the car seat out of the back and into the front so my son can lay down in the back, and even then his feet kick the car seat. I was so happy that Chicco finally came out with the double stroller that accepts the Chicco Keyfit carseat! Unfortunately I had bought the side-by-side stroller about 6 months ago when my son was born. It was a nice stroller but usually took a few attempts to get through doorways and had a few other weaknesses. This stroller arrived partially assembled and it was very easily finished. I love that you can put the carseat in either seat. The sun shades are nice in that they are multipositional and will stay in place. The zipper access to the storage is a great idea because it was one of the biggest frustrations with the Chicco travel system. It turns easily, and I have no problems getting it through doorways. The fabric is very nice and thick. My only question for those of you who have this is how the bassinet option works for the back seat. I found the flap but don’t know where I’m supposed to attach it. It folds up very easily and is a little heavy, but nothing out of the ordinary. I’ve owned 3 other types of double strollers and this is by far the best of the tandems!!! It’s a little lighter than the Graco, has a comfortable handlebar & can be steered with one hand briefly. I have a newborn, a 3-yr-old and a 4-yr-old. Having the baby and one of the bigger kids in the stroller is a breeze. Love the overall quality of this stroller! I have a 22 month old and a 6 week old. I have the keyfit 30 infant carseat. If fits perfectly in either seat of this double stroller. I was so excited when I heard this was coming out. I am just as pleased with this double stroller as I was with the single full size stroller. This double turns easily, folds up easily and is light for a double stroller. 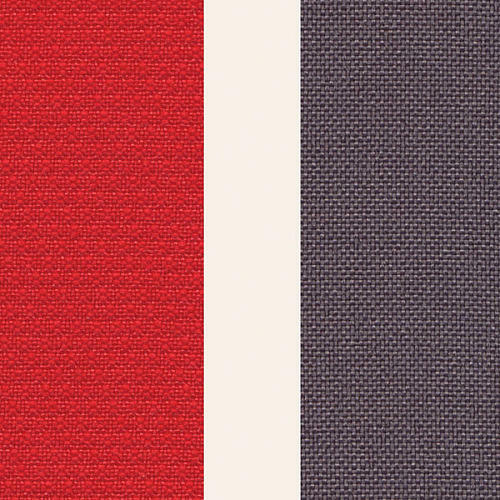 I have the red one to match my carrier (got it from […] online). My toddler sits in front. we have the cup holders on it. So he can hop in and out easily (I just unbuckle him, which is easy to do with one hand). So happy to be able to take both kids on walks together. The basket is also easy to access. The zipper makes it easy to get to the back. Accessing the front of the basket is easy to do by folding the fornt seat forward, so you don’t have to pull everthing out of the basket. I have a 28 month old and a 4 month old and couldn’t wait for this stroller to come out. I have the cortina single stroller and I absolutely loved it, but with two it was necessary to have a double. This is just as great as the single, and is easier to manuever than I thought it would be. I love this stroller. After reading all of the reviews I went ahead and bought this stroller online […] Sight unseen. After a few days I became antsy and decided to head to a BRU about an hour away to see if they carried it in stock so I could try it out. I fell in love. This stroller is amazing. It felt no different than pushing my single travel system stroller. Since our newest bundle has yet to arrive I borrowed the infant seat to match. I snapped it in so I could cruise around BRU as if the other child was there.My son (1 year) loved being in this stroller, he had more than enough room in the back and front seat even with the carrier attached to the other seat. It was easy to fold and kinda heavy but much lighter than my peg perego duette. I felt the turning radius was nice and am super happy with the basket, as well as the cup holders. The little compartment on the top is okay, maybe for keys and a phone, but not much more. My biggest concern that I have not see addressed was what the back seat had as far as a tray/Bar/or cup holders. It comes with a tray that you may be able to keep snacks on. No cup holder which is fine I can buy a snap on one for not much money when I need it. Overall I am super excited to use this stroller in the real world. I am a mother of newborn twins and after waiting months finally received this stroller. I have 2 keyfit 30 carseats, and they snap right into place in the stroller. SO EASY! It maneuvers SO nicely; no problem going in and out of doorways, and it glides…even on gravel and grass. It’s comfortable, durable, and classy. I read where others say it’s bulky or heavy and I disagree. It has a slight bit of weight to it, being a double, but my great grandmother could push the babies around in this. I couldn’t be happier with my decision to go with Chicco for my carseats and double stroller. It’s perfect. We just picked up our Together Cubes stroller at BRU and couldn’t be happier. We are awaiting our second son’s arrival in July, but already am taking our one year old out in it to get him used to it. The stroller is light, and when folded seems basically the same size as the single Cortina we have. We have the Extreme (orange/silver) keyfit 30 it looks great with the Cubes design. It stows easily into the trunk of our small SUV (Nissan Xterra) with some room for small bags at the sides. I am not sure how it would do in a sedan, though. Our son enjoys riding in the front, though I don’t think those with toddler/infant combo would be able to switch the two from the front to the back. Mainly because with the toddler in the back the toddler is looking straight at his sibling, can mess with him, and doesn’t have much of a view otherwise. But the front seat seems to do just fine. We put the bar out to hang toys on it but when he is older and doesn’t throw everything to the ground the cupholders should get some use. I did notice when taking out the car seat two hands are required. You have to use one hand to push the clasp in and the other to pull up on the bar. Otherwise the clasp just sticks. This is important when figuring out which kid to remove first from the stroller. If your toddler is a runner you might want to do the infant seat first then unbuckle your toddler. This was a little annoying to me because my toddler is impatient when he is not moving lol. I love that you can access the basket when the rear seat is down. You have plenty of room in there for a few items if you go to the store. The handlebar turns on a dime. It is a bit thick for my hands and tricky using just one (which is needed to get in and out of doors) but am hoping with practice it will be fine. Overall I am quite impressed with this stroller. I am so glad it came out as I hated the Graco doubles. They felt and looked humongous and ugly. We got $65 off ours because we had a 20% off coupon and $5 rewards. Definitely recommend buying in-store for that purpose. Oh and they now install it in-store for you! My car has a big trunk but this stroller does not fit into it. I have a 16 mo. old and I’m due for my second in a few weeks. I really liked the possibility of having a double stroller that was made for our car seat. We tried out the car seat. When it is in the front, a toddler in the back could play with the baby in the car seat in front. It rolls pretty smoothly. It is harder to manuver when the weight is too far forward, but with two in the stroller that probably isn’t noticable. I would keep this stroller if it fit in my car, but I’m going to have to return it. 🙁 If you need to have the stroller in the car, then don’t buy it unless you have an SUV or a trunk that is bigger than a CTS. When I found out that I was pregnant and my children were only going to be 19 months apart, I knew a double stroller was in my future. I searched and searched for one and really wanted a Chicco double because I loved the single I had for my daughter. Finally Chicco came out with this stroller and even though I had to wait 8 weeks for it, it was well worth the wait. I have the sit and stand stroller also from another company and there is no comparison. This one is a dream. Pushes like the wheels are riding on air. So easy to turn and push and fits the chicco carseat I have. It is well worth the money! I have been using this stroller for a few weeks with my newborn and my 23 month old. It is awesome! It is SO easy to maneuver, even in a crowded store. Its easy to fold and fits fine in my car. It is somewhat heavy, but light compared to other double strollers. Very comfortable with plenty of leg room for toddler in front or back seat, infant seat easy to get in and out. Stears well even on grass or through doorways. Love the zippered storage bin, which was one of my complaints about the single Cortina we have. Easy to fold and unfold, also folds without having to remove parts like some double strollers.Fits fine in our CRV. Only complaint it is very heavy, though most double strollers are, would reconmend a Jogger if you want to use it for rough terrian or jogging. I was dissapoined our BRU did not have one on display to try out before buying, but have never been dissapointed with this brand,so ordered it without seeing it 1st. i just got it today in Romantic pattern and is just perfect , so lightweight , compact even fit perfect into my tiny xc90 trunk , we have all the 7 seats up and the trunk room it just perfect for it , was the only double one that fits , i had the graco tour duo and it was huge and so heavy wont fit in our suv , finally i found the perfect one =)i really don’t have cons !! Loved it the minute I took it out of the box. Some assembly is required but did it all without my husband. We have an infant and a toddler so the back is always reclined for the car seat. The zipper compartment for the underneath storage is perfect. A double stroller is always going to be big but this feels compact and nice. We have a rather tight sedan trunk so we thought it was not going to fit. It just barely fits but absolutely nothing else will. My toddler loves being in the front. And at the mall we get many compliments on the stroller. Worth the investment. We ordered this from BRU online and we got it in yesterday. I put it together all by myself (almost 8 months pregnant). I followed the instruction booklet step by step and it was soooooo easy to put together. Once finished, I tried all of the different options of infant carrier & child. The only thing I thought was interesting is that if you have a child who is very tall, their feet hang real low in the front seat, and if they sit in the back seat, they hang and drag in the basket. Overall- this stroller has so many options, I cannot wait my for my 2nd son to get here so we can go cruise in the new stroller! I ordered this on a Sunday and had it by the following Wednesday. I put it together myself, with a little help from my 2 year old, in about a half hour. Its really nice looking and made well. I love how its a double stroller but narrow and one of the lighter ones I’ve tried. Seems to have everything I was looking for…fits my chicco carseat, carseat can go in front or back, comfortable for my good sized 2 year old, folds up easily, stands on its own, cupholders for me and 2 year old, and large accesible storage compartment. I don’t have my second baby yet so we will see. But, I did buckle my son in and wheel him around. Handles well, and he seemed pretty happy too! I have a 3 month old and a 3 year old who has special needs so she can’t walk for long distances. I own the Keyfit Infant seat and looked at double strollers forever since not many fit my infant seat. The Sit-In-Stand didn’t work for us because of my 3 year olds needs and many others were too bulky and heavy. We decided to wait for the Chicco Double Stroller and I am glad we did! It’s big but not heavy to push, it glides very well. It fold up easily and doesn’t take up my entire back to my Honda Pilot like some. My daughter likes riding in the front seat, which I like that the infant seat can sit in the front or back. Many other double strollers required the infant seat in front and older child in back. I felt that would be hard to get my older child out and she’d want to see the world around her. This is a great stroller! We have a two year old and a three month old. I have taken it to the park, the mall, and numerous other places and it rides smoothly and easily maneuvers around obstacles. I like that I can take the girls out by myself without having to rely on other people to help me out. I love that my Chicco car seat "clicks" into either seat. We have also put my niece’s car seat (different brand) in and it fits easily, too. It is pretty heavy, but not any heavier than the other double strollers out there. It folds up exactly the same as the single Chicco stroller, and it fits into the back of my Nissan Altima with about 1/3 of the truck to spare. The basket in the bottom is easy to access by the zipper when you have your infant car seat in the back. It also has the basket continue under both seats to give you extra storage. The only thing I would change is that it needs to have a cup holder for the back seat. It doesn’t have one at all, and I can see how this may be a problem when my youngest starts using the forward facing seat. This thing is huge! Way to big. We really like this stroller. It safely holds our newborn and keeps our 2 year old safe. It is very easy to move around and switch positions (older in front but if he is sleeping we put him in the back slot). I’m very happy with the product. 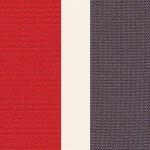 downsides – sometimes the fabric blocks the carseat from clicking and it is long and takes up most of the trunk space. I loved my first single Chicco stroller which is why I wanted the double stroller now that I have 2 children. It is a very nice durable stroller. Both my toddler and newborn fit nicely with nice access to the compartment below. I was a little dissapointed with the heavieness and akwardness when folded. My husband and I have a large SUV and it barely fits in the back. We also have no idea what to do with the front canopy when folded. It has to be removed. We’ve had this stroller for about 3 weeks now after waiting several months for it to be sold by BabiesRUs. We love it!! It is so light weight, so easy to fold and unfold. Super easy to get our 2 month old (in his Chicco carseat) and our 2 year old in and out. Very easy to steer. We get compliments on this stroller all the time. Its great that we can switch our two boys from front to back. If our 2 year old needs to nap, we simply sit him in the back because the seat reclines. If he’s awake he wants to be in the front to have a good view. The basket underneath is huge and it’s so easy to get what you need even if the back seat is reclined thanks to the zipper. Don’t hesitate to buy this stroller. If you already own a Chicco stroller (like we did) you know the kind of quality that the Chicco brand delivers. Great stroller. I have a 2 month old & a 3 year old. My toddler loves sitting in the front with the cup holders. Its extremely easy to open & fold up. Yes, its heavy & bulky, but it is a double stroller! Love the basket underneath. You can access it from zipper or between seats. my daughter loves dropping her stuff between the seats so she doesn’t have to hold it. Very easy to steer & maneuver. I was steering it with 1 hand. I wish it had stadium seating, so the child in the back could see over the front seat. The backs of the seats don’t have much of a side to them for the child to rest her head if she wants to sleep. Other than that, LOVE the stroller. I haven’t used it for two yet, but I put it together easily. It is very lightweight considering the size. My 2 year old likes it a lot and the infant seat goes into it easily in front or back. The zipper in the back to access the storage underneath is great. The only drawback so far is that when my 2 yr old wants to sit in the rear, the infant seat makes it a pretty tight squeeze. I searched for a stroller to fit the Chicco carseat with and couldn’t find one. When they came out with this one I was ecstatic! Our 2 and a half year old loves to ride in the front and see. He is tall for his age and fits perfectly. We also have a newborn. The stroller is easy to guide. Love it! I am a typical male and therefore would not be writing this, but this stroller is definitely worth getting, if you have the money. It is great quality, easy to put together, attractive design, and not as heavy as some double strollers. I have done the research and this is the best double stroller out there. I love this stroller and I am so happy that Chicco finally came out with a double stroller that holds my Keyfit carseat. I also like how I can put the carseat in either the front or back. I am a mom of a newborn and 21 month old that is very active. My oldest likes sitting in both seats and also enjoys being able to face the baby when the carseat is placed in the front and toddler ia in the back seat. I especially like the changes that Chicco has made to this stroller; I have a 2 year old single stroller that came with the carseat….the basket is much larger and easy to get to when the carseat is using the back seat since they have added an easy to open compartment. And I am very impressed with how easy the stroller is to manuever considering how big it is; can push with one hand! I would highly recommend this stroller to anyone with two children or more! I purchased this stroller after our second child was born. With the first child we had the Chicco travel system and was very happy with it. I was excited that Chicco came out with a double stroller that allowed the car seat to snap in place and just in time for our new arrival. It was easy to put together, and so far has been extremely durable and sturdy. Don’t kid yourself though, even though it is advertised as lighter than competitive models it is still a double stroller and is pretty heavy although I can still lift it to get it into the back of our vehicle. We have taken it on several walks so far and my only complaint is that with my toddler in the front making it front heavy and walking on any surface that is not completely level it will tend to pull to the side. Because it is so long I’m not sure there’s really anything that can be done about that. One more thing, when you fold it up, we can’t figure out how to position the sun visors so they don’t stick out or pop off the stroller. Maybe there’s a trick we haven’t figured out yet but right now we see it as a design flaw. Overall I am very happy with the purchase and hope to use it for a while. The handling on this double stroller is GREAT! Smooth ride for the kiddos. We have the Chicco Cortina travel system & again the KeyFit 30 Infant Car Seat goes in & out like butter on this stroller as well. Very happy with the basket feature with the zipper for easy access! The stroller fits in our Subaru Outback so no worries there either. We have a 22 month old & a newborn and I’m so glad we got this! I use this stroller to cart around my 2 year old and 5 month old. I absolutely love this stroller! I am so glad that Chicco finally came out with a double stroller that securely locks the car seat in place. The zippered compartment on the bottom was a great addition. Rides very smooth and has great turning radius. Love that the back seat lays down flat. This stroller is much lighter than other double strollers I have tried and it folds up a lot easier. My only complaint is that the front cup holders don’t hold the sippy cup very well. We lost one in the mall last week. I ended up going back to Babies R Us and buying the sippy cup strap so I can attach it to the stroller. I would definitely recommend this stroller! This stroller is great they have hit all the major points. It has plenty of storage and easy access no matter how you have it configured. We are very happy with it. We really like this stroller. It has been the only thing besides a really old snap and go that will fit the chicco car seats. My complaints are: Its really heavy. I feel like I get a work out just getting it out of the car and put together, then get the twins in and the same things putting it back. 2. Sometimes it doesnt want to come up from a folded position and I have to fight it. easy to use. operates wonderfully. easy to put together. smoothe ride. 34 month old loves it. keyfit car seat easy to click in front or back. It is heavy but all double strollers are. attractive. Super easy to open and close. I have a 5 week old and a 3 year old. I love that it maneuvers easily. I’ve used other double strollers and there’s no comparison. I also love that I can open and close it with one hand. I have another brand carrier and it fits in it safely. Plenty of basket space. The only issue I have is that when I have my 3 year old in the front seat, the seat belt is really snug. Other than that, I love it! I LOVE this stroller! My 1 1/2 year old hates riding in a stroller, but loves to crawl up in this one (the front seat). The front seat seems less restricting to her than other strollers since it has no "front" and has the 2 cup holders on either side! Lightweight compared to other double strollers. Opens easily. I do have trouble closing it at times, but hoping that will fix itself after a couple months of use! Strolls great. Another great product from Chicco!! The ONLY reason I rate this 4/5 is because it’s huge lol. But, what double stroller isn’t? But the great thing is, regardless of the length/size… it’s pretty light. It folds up almost exactly to the same size as my Chicco travel system… and everything pretty much functions the same, pop/lock. It takes a little getting used to the length in the front, avoiding bumping into things… but it’s very easy to steer & no need to put a lot of muscle behind it; glides along. My 2-yr-old loves riding in the front and I put my newborn in front of me. It has great storage, 4 cup holders and it’s very gender neutral. I love it! Very easy to use, lightweight for a double, and quality construction. I just love it! its so nice, easy to use for my 2 yr old and 2 wk old..i have the keyfit 30 to match..would choose this all over again!yayyy for chicco products! I had the original 1 seater Chicco travel system when I had my son. My kids are 16 months apart and I could not wait to get this new double stroller! I love love love it!! I love how easy it is to open and shut, especially when I am alone with the kids. It is so fast and convenient to open and close! The only thing I don’t like is that the front seat doesn’t have the best recline. Best of its kind IMO! Its also way easier to maneuver than I thought! Has a nice smooth ride to it too! This is the best stroller ever, only thing I don’t like is that the second seat doesn’t get a cup holder but that’s Ok. Overall good stroller. The sun shades are hard to maneuver & have to be taken off each time you take it in & out of the car. Car seats fit great, but sometimes it’s a little difficult to fit the seat in the space that is closest to the handle bar & I have to spend a few minutes battling to get it out & with twins I don’t have extra time to waste.[…]. Love the cup holders & it has a lot of storage space on the bottom. Has a nice smooth ride. I love that it has all the features of the single stroller especially the adjustable handle bar since my hubby is 6’3" and I’m 5’1". It’s a great stroller but there are things I don’t like such as, the front seat won’t recline when the car seat is placed in the back seat, you have to take the front canopy off in order to fold it, and it does not fit in the trunk of our VW Jetta. Otherwise, this stroller will be great for my 22 month old and newborn. So far we are happy with this stroller. It is still pretty heavy, altough for a double stroller I guess it can’t get much lighter. Our Chicco infant seat fits perfectly and our 18 month old sits in the front. Difficult to walk down bumpy sidewalk..I either have to push super fast or stop and pick up the front to get over the bumps. Good storage space! I spent a lot of time researching double strollers. I was so excited when this one finally came out but was hesitant to buy it because I could not find it at any store so I could try it out. Since all of my other big baby items are Chicco I felt confident that it would be the same quality. I just LOVE IT! It is so easy to push and very easy to collapse. It isn’t as heavy as the others I tried out and it is very roomy for the kids. Right now mine are 2 1/2 and 8 months. I just had it out around other moms and they compared it to theirs and they said it is so nice! They just loved all the different features…especially the height adjustment on the handles and the zipper for the basket underneath. There are only a few things I think would make it even better. It dose not have cup holders for the back, which was a little disappointing, but we were able to purchase an attachment that allowed the person in the back to put a sippy cup and snacks in. It is cumbersome but I think all double strollers are. I wish the bar for the back seat would go up to make it a little easier to get the baby in and out. Finally, the person riding in the front can either have the cupholders in or a bar across the front. My daughter likes to rest her arms on a bar so I wish you could have the option of leaving them both in. That probably isn’t as big of a deal to others as it is to her though! I am just so happy with this purchase. It is one of the best things we ever bought! I am happy I didn’t buy a different stroller before this one came out! baby number 5 is here. My 3 year old is a runner, so a double stroller is a must for us. This stroller is wonderful. Chicco set snaps right in and harness holds my 3 year old in place. She loves her cup holders and being able to climb in and out by herself (when she’s released from her harness) Harness is tricky enough that she can’t undo it. Stroller is large and VERY heavy. Front canopy is a annoying when you are folding it up. We’ve already been to the zoo, and many other places. The only really issue is that it’s too big to maneuver through the racks of clothes at the mall. Forget about going in the smaller stores…. It’s very solidly put together and I think it will definitely last. LOVE LOVE LOVE the zipper access to the basket! I have a two and half year old and a newborn. We looked into Sit & Stands, but found out Chicco car seats do not fit into these strollers. This was our only option if we wanted to have a way to transport two kids. I wish the front seat was deeper and included a snack tray, but other than that it is perfect when the two year decides he needs a break from walking. The stroller came bigger and heavier than I’ve expected, but it’s ok because it still fits into my BMW X5 nicely with some trunk room left. I’m very small and petite so lifting it in and out is quite a workout. I took it for a test drive to the mall all by myself with two babies and I have to say its a great stroller. It rolls smoothly, my babies seem comfy, gets through narrow aisles, and most of all they love to sit in it which gives me time to shop!! I’m so happy with my purchase. Obviously what first drew me was the Chicco name. I have a cortina system from my first daughter (now 2) and wanted a double stroller to contain both her and our newborn. The carseat fits perfectly in either front or back just like in the single stroller. I wished I could have compared this to the sit&stand side by side but I couldn’t find it in the store. I also didn’t have a chance to see if the chicco carseat would attach safely to the sit&stand. Some people say it does, some say it doesn’t. I love that there’s still the option of letting the big kid on and off easily. With this stroller, they get on and off from the front seat instead of the back. It really does fold up to be the same basic size as the single by width. It is simply longer/taller when folded especially if you leave the front sun shade on. Luckily the shades come off easily. It’s a bit heavy but it’s not an umbrella stroller :). I feel kinda like I’m pushing a semi but it handles well. I have three main criticisms: 1)the back seat has no cupholder…I think it would be nice to have something that would hook to the frame. 2)The other is that, while the handlebar has 3 adjustments, the lowest is a bit too high for me (5’3" tall). It’s still comfortable enough putting my forearms just below level with my elbows. 3)I liked the way the sun shade on the single adjusts better. This requires two steps (undo the lock, then pull it out/in). All together, I love this stroller and am happy I bought it. I picked the "romantic" color since my carseat wouldn’t match any of the options. It’s hard to see the colors (i was worried it might be light blue) but it’s basically black and silver/grey. Thought this stroller would be my ticket to freedom with my 6wk & 3yr old, but I was wrong. Love my original, single Chicco stroller and car seat so I thought I’d love the new double they came out with. Advertised as being 15% lighter, which means nothing. Just pulling it out of the box was difficult. Looks compact online but really is like the limousine of strollers. Hard to navigate. The front seat is a joke for a tall toddler. His feet hit the the large front wheels which could be dangerous for him because it was difficult to keep them on the foot rest. The only positive thing about the stroller is that it is the only double a Chicco car seat will click into. Still not a good enough reason to keep it when the negative aspects out weigh the positive. We bought this stroller without seeing it as it was still too new to have made an appearance in our local babies r us. We couldn’t be more pleased. My toddler loves it and constantly wants to go for rides. It’s easy to get the infant car seat in the back portion too. Love the zip feature on the bottom for the basket and 2 cup-holders for adults. My daughter also loves the cup-holders that attach to the front seat. The stroller is big and somewhat heavy, but what tandem stroller isn’t? It almost takes up the whole back portion of our SUV, but it’s worth it! I love this stroller!! I have a 4 year old, an 18 month old and a newborn so I am busy this stroller allows me to put my boys in there and keep them together on daily outings. I love how you can put the carseat in the from or back allowing the older child to sleep or see. This stroller is a must have for parents of 2 or more or multiples. I love chicco products you just can’t go wrong!! This stroller is way too heavy and bulky. I have an Escalade and it took 30 minutes to maneuver the seats and adjust everything on the stroller to get it to fit in the car. It’s not a practical stroller to constantly put in and out of the car and for daily use. The only nice thing about it was that it was nice to maneuver and a smooth ride. But I returned it after the first use…definitely NOT a keeper! I purchased this stroller for my newborn and 21 month old. It was very easy for me to put together during my kids’ nap one afternoon. I took it out today for the first time, and I must say, I thoroughly enjoyed using it. It IS very large and heavy, but I assume all double strollers must be. As others have commented, I also had to remove one of the canopies to make it fit in my trunk, but this wasn’t really troublesome. Once I got it in and out of the car(Lexus ES 350), set up was no problem. Our Key Fit 30 carseat snapped in easily, and even better, my toddler was eager to jump (and for the first time EVER)STAY in! The stroller maneuvers very well despite being so long, and I had no problem navigating the aisles in the stores I visited. The large basket underneath very conveniently held my large purse, small diaper bag, and a couple of shopping bags. My toddler sat in the back with his sippy cup, and although there are no cupholders, this was not a problem for him. He just held it next to him. At one point he dropped his toy phone and kicked off a shoe, but I loved that these just dropped into the basket underneath! This stroller is a lifesaver. With a 2.5 yr old and a 6 month old, I couldn’t be any happier. For those of you complaining about the weight of this stroller, you bought a double stroller! It’s GOING to be heavier than your basic travel system. It turns on a dime, smooth like butter. WELL WORTH EVERY SINGLE PENNY!!! The basket underneath is HUGE. Folds and opens with one hand. The rear seat folds down completely. Fits easily in the trunk of a new sentra. I highly recommend this stroller, especially if you have a 20% off coupon. my husband and i just recently had our 3rd child and we realized with a 5 and 4 year old we needed something bigger. i wasn’t ready for a triple stroller though. so we looked into this stroller because we already had the carseat to match. so far, we love it. our children love it. and it does what i need it to do. when i purchased it i knew it was gonna be a bulky and heavy product and it is. but its to be expected. i would recommend this product to friends and family. its sturdy, stylish and does the job. I did some research on the double strollers and finally decided to go with this stroller. I have a 2 month old girl and a 1 yr old girl. I absolutely love this stroller and so does my husband. We previously had a Graco stroller for my 1 yr old and this double stroller is way easier to maneuver. I like the fact that I can switch the girls, if my 1 yr old is sleeping, then I’ll put her in the back and the car seat in the front. The only reason I gave it four stars is due to the fact that the front seat doesn’t recline much and also because I have to remove the front canopy everytime I put the stroller in my vehicle, which is a Honda Civic, maybe that’s why lol but other then that the stroller fits in my car perfect! No regrets…so people, just go buy this stroller! You wont be dissapointed. Very hard to maneuver when trying to fold stroller for travel. Front foot rest not adequate. It is too far back under the seat not allowing my 2 year old to rest his feet on it. Front canopy very flimsy and not really too useful. And, the car seat carrier gets stuck in the back portion of the seat and takes extra work to get it loose. I am very displeased!!! You can easily snap the Chicco car seat into it. I love that you can place it in the front seat or back seat. When we want more control of our toddler, we place her in the back and baby in the front. But when we are just enjoying a walk she loves sitting in the front to see better, and hop in and out on her own. It is also a great feature that the rear seat fully reclines. This is nice for a napping toddler, and makes a great bassinet for a sleeping baby. The basket underneath is very large and very accessible. Adding the zippered front is a huge help, to be able to access things even when the back seat is fully reclined. I was able to easily carry diaper bags, luggage, groceries, etc in that thing. I also like that the basket stretches in front of the rear seat. If our daughter dropped anything, it caught it, which is nice when you are running to catch a train, and not keeping track of everything! The canopies work well. They aren’t large, but the fact that they adjust so easily means you can keep your children covered from rain, or keep the sun out of their eyes, no matter what angle. I also love having the two cup holders for mom and dad, as well as the two cup holders on the front seat. A con, however, is that there are no cup holders for the back seat. And the two cup holders on the front can be switched which is nice. But, if you have them turned out, you can’t fold the canopy up when the stroller is folded, and if you have them turned in, you can’t fold the front seat down to accommodate the car seat. But this is super easy to adjust. The seats move very easily as well – one hand adjustment. The brakes and wheel locks are great and easy too. Even with its large size, the stroller turns on a dime. The handle bar adjusts easily for pushers of different heights. Sometimes we found the stroller can be a little tricky to fold up – the lock only requires one hand, but you have to maneuver the stroller just right to get it to collapse on itself. When folded up, though, it’s not too huge – it easily fits in our Honda CVR, no problem. It’s great for on the go, easy to set up – no adjustments needed. The stroller proved to be very durable – considering we hauled it on and off planes and trains, as well as up and down cobblestone streets and off-road. Like others have said, it is heavy, but it is a double stroller, that’s what you get. It is lighter than many options, though. My close friend has a Graco double, and she is super jealous of our Chicco! One other negative is there’s no handle or really great place to grab the stroller to carry it when it’s folded up. The feature that allows it to still roll when folded is nice, but obviously doesn’t help when you are going up stairs. I truly love this stroller, and I would highly recommend it to anyone. Coming from one mommy who didn’t especially want a double, is only five feet tall (and not very strong! ), but realized she needed it, I would never use another double stroller. This is the way to go! This is the second double stroller we purchase (the previous one was a joke) and I LOVE IT! It is a godsend. Thanks Chicco for creating such a wonderful stroller. You finally made my life easy. I have a 2 yr old and a 1 month old and I use it all the time. It folds smaller and easier than most double strollers but it is a little heavy to lift in and out of the car ( but what double stroller isn’t). It is easy to maneuver and I love the size of the basket underneath. I don’t know haw easy it is to put together the store did it for me. We have a boy and girl 18 months apart. We were drawn by the key fit system since we already had one and did not want to start over. The car seat did not seam to fit the universals on the market, and we did not care for most of the other doubles. So we got this one, but after only a few weeks had to replace the VERY flimsey sun shades. Chicco does have excelent customer service which sent us new shades in days. It is a little tough to steer fully loaded. All in all ok but they should go back to R&D.